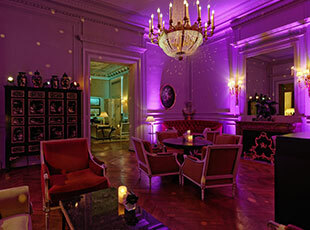 Launch of "Shangri Lounge" soirées at the Shangri-La Hotel Paris. Now, every Wednesday, one can enjoy the refurbished parts of the Shangri-La Paris’ hotel lounges for a cocktail or a glass of champagne, to the mellow sounds of a DJ. In a setting specially designed and tailor-made by visual scenography agency Your Tailor is a Punk !!! the hotel is transformed through light projections on the walls and ceilings, with bamboo, orchids and elegant mirror balls creating a quirky-cool kind of atmosphere. For the occasion, Christophe Léger –Chef Barman of the Shangri-La Paris – has designed a special drinks menu for the soirées. And for those with a little appetite, a dim sum menu is also available to mix gourmand notes with an array of exotic flavors.